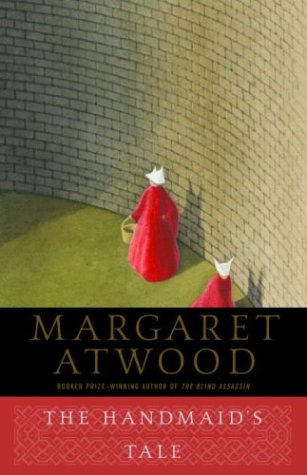 Since I started reading The Handmaid’s Tale by Margaret Atwood I’ve seen this book everywhere, maybe in part because it’s banned books week. I just saw The Handmaid’s Tale on a pin of the 50 scariest books of all time. And I must say it fits on that list. It’s not a horror novel or a work of supernatural terror. This novel is unsettling. It’s prophetic. It’s terrifying because it could possibly happen and has been happening, in varying degrees, around the world. The Handmaid’s Tale centers on a woman known only as Offred, literally meaning belonging to Fred. Through Offred we learn that the United States government has been overthrown by a totalitarian Christian theocracy. This Christian theocracy, known as the Sons of Jacob launches a revolution in the U.S. where they kill the president and Congress and manage to suspend the Constitution under the pretext that they are trying to restore order in the chaos they created. Quickly this group takes away all of women’s rights through use of their credit and debit cards, which to me is terrifying because it could be so easily done. After taking away women’s rights each woman is assigned a specific task in this new society. Offred becomes a handmaid, which is a nice way of saying baby machine. That’s her entire purpose in this new regime is to produce offspring for Commanders and their wives to rebuild the population. The women in this new regime literally have everything ripped away from them. They no longer even have their own names. They belong to a man and that’s their role. They are no longer able to read or write because the male commanders feel that this would give them too much power. In an interesting scene between Offred and her commander, he explains that the theocracy felt this new society would be better. But better never encompasses everyone. I really enjoyed Offred’s narration. You can feel her isolation, her longing, and her fear. You are totally encapsulated in her world. You see, feel, and hear everything she does. But with her narration you have to realize that she is human. All that she sees and reports may be tainted by her own thinking. Especially at the end you realize how much Offred took control of the narrative, perhaps even chaining a thing or two. The Handmaid’s Tale is a truly breathtaking work of fiction. It makes me want to go out and read more Margaret Atwood. If you’re looking for a dystopian novel to read, or a book for banned books week, give this one a try. It’s truly terrifying in it’s implications.